I had a surreal experience today: I went to WNBC’s studio and saw the newscasters I watch every day in action! I was nervous—TV isn’t made for introverts!—but everyone in the studio was very kind and I relaxed after a while. Last fall I sent my books and some diversity articles to several media personalities, hoping they’d be willing to start a public conversation about the need for change. Basir Mchawi at WBAI and David Ushery at WNBC are the only two who responded, and I’m very grateful that they let me share my views on race and publishing. 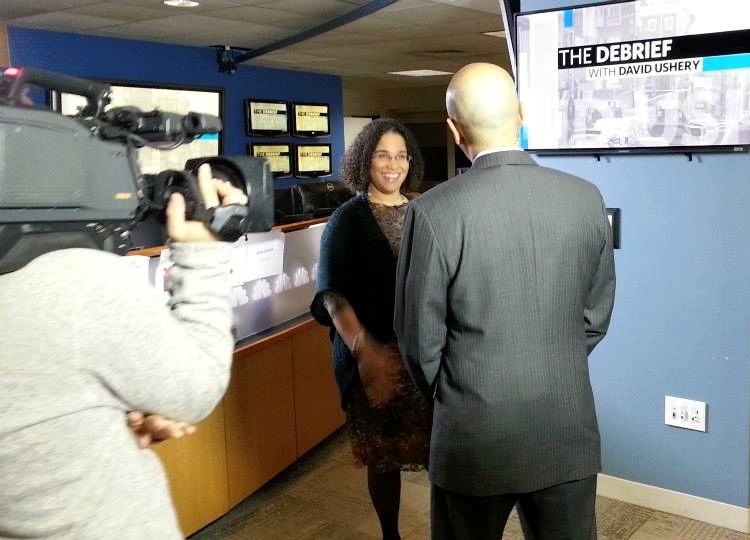 The Debrief with David Ushery airs on Sunday mornings at 5:30 am but if you’re not a morning person, you can watch my segment on “the diversity gap” here. Zetta, you were fantastic! Succint. Informative. Animated. Passionate and definitely on point. All within 4 minutes. Really appreciate your scholarship and activism in the area of children’s literature. Keep up the good work! Thanks, Cheryl! If only I had your fabulous sense of style to top it all off…I really appreciate your support. that was so great! you were/are brilliant! Thanks, L! I wanted to be seen as an artist rather than a scholar but they clearly wanted me to wear my prof hat–and that’s ok. For now. Zetta, YOU WERE WONDERFUL! Will you please tell me where I can access the great graphics you used in your interview? Hi, Lee. We definitely know about Cinco Puntos Press! I take recommendations from the women in our BPP group and we’d be happy to have you send a list of titles for us to consider. We’re also thinking of reactivating the BPP blog; if you’d be interested in writing a guest post to feature your mission and a few titles, let me know. Great job, Zetta! You made your points well in a short period of time and had a nice interaction with David Ushery. I’m glad you didn’t have to be there on Sunday morning at 5:30 for that show too. A writer, Aliona Gibson, posted your video on my Facebook page and I just had to let you know how important your message was and that you did an awesome job.